I have had the pleasure of working with some wonderful teachers and improvisers from around the world. Sometimes we Maydays invite favourite teachers back over from Chicago (Bill Arnett, Nancy Howland Walker and Marshall Stern) and New York (Jay Rhoderick) to fine tune us and join in our shows in Brighton and London. And let’s not forget Tim Sniffen (Baby Wants Candy) who coached me and 8Bit at the end of last year. When I was at iO and Second City, I met some great American, Canadian and Australian improvisers who I loved performing with. I also dearly miss Jason Delplanque from the Maydays who has moved to South Africa to take the improv world by storm over there. I was contemplating the international talent I have connections with and realised that – of course – we live in a world of vast media and communication opportunities. Why not make an online improv show where any of these people, and any of you, can add the next scene. London Improv have been kind enough to act as host and me (Katy Schutte) and Laura Mugridge are launching ‘Open Letters to P. W. Wiseman’. Open Letters to P. W. Wiseman is an online Harold where we publish an improvised scene and ask the world to improvise the next one. There will be 9 scenes (or so), each inspired by the last and by the themes ‘organic’ and ‘rural’. Scenes must be one continuous shot with improvised dialogue and have a connection (i.e. to do with character, object or environment) with the scenes that have gone before. Open Letters to P. W. Wiseman has three chapters and we encourage successful submitters to film second and third beats to their story or exploration. Each scene must be under 5 minutes and entered within a week of the previous one being published. To enter, publish your scene on youtube and send the link to katy@katyschutte.com including which scene number it is. As this is our trial show, guidance/rules may change as the project goes on… Good luck – let’s make some new comedy! Broadway Baby - "...effortlessly funny from beginning to end..."
Edinburgh Spotlight - "...certainly on a par with Paul Merton"
Remote Goat - "...the laughs came thick and fast..."
Latest 7 - "Both accomplished and absurd - a must see!" Fringe Review - "...consistently on top form: funny, clever and quick..."
Fringe Guru - "...this is the purest style of improv..."
I work with chum Rachel Blackman on this two-girl improvised theatre comedy show. One story. Real characters. One hour. Completely improvised. It's like watching people fly. We have also made scripted 'Momentary Lapse' webisodes by Brian Mitchell and Joe Nixon for Jibba Jabba. ""...the laughs came thick and fast, the audience swept along with Katy and Rach..."
The Maydays are an improvised comedy company and lots of my dearest friends. I have been with them since 2004. I'm an improviser and Director. The Maydays won Best Comedy Show at Brighton Festival for Mayday! The Musical. We perform Guest Who, Tonight's Top Story, Confessions, The Fringe Show and The Seagull Has Landed, all of which take audience suggestions to create scenes and songs in the moment. I directed our newest production: Oh Boy! 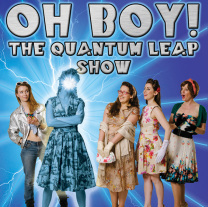 The Quantum Leap Show! “...hilariously funny, each performer capitalising on their own different styles of humour to the delight of the whole audience." 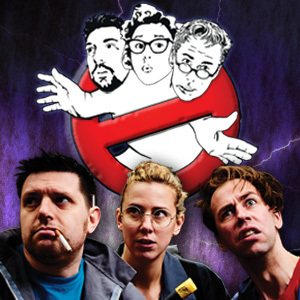 Project Two is an improvised science fiction comedy show. I came on board as a coach/director in early 2012 before founders Chris Mead and Jon Monkhouse invited me to join the cast. We also make film shorts and hang out a lot. We have performed at Futureshock for Camden People's Theatre, ImproFestUK, Bristol Improv Festival, Leicester Square Theatre with Geekatorium, La Scala with White Mischief and Tristan Bates with ImprofestUK and at the Albany Theatre, Deptford (as well as in many rooms above pubs). We are now curating a night of other fantastic nerds entitled Geekeasy which is a monthly treat at the Nursery Theatre, Southwark. Me, Tom and Jon pay tribute to the best film of all time with original songs, cardboard props and lots of love. We sing, slime and bust our way through a one-hour interactive multi-media show. Think Reduced Shakespeare Company meets Be Kind, Rewind. Our debut at the Edinburgh Festival Fringe was met with standing room only and a five star review! Lyrics by me, music by me and Joe Samuel and book by me, Chris Mead & the cast. "What the world has been missing"
I have a film idea that I would like to share with you. I will be all the characters, the cinematography, the sound and the story. You will be the imagination. Directed by Laura Mugridge with original musical score by Tom Adams. In collaboration with Rachel Blackman & Haruka Kuroda. "Schutte proves an engaging and versatile actor"
Chortle - "...could easily hold [her] own with the likes of Merton, Frost and Jupitus"
In 2011 I worked with NewsRevue as an actor and comedy writer. 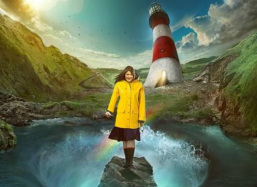 The show is a topical sketch and song extravaganza over one hour for four nights a week. I had a great time! Over the years, the show has won the Fringe First Award and a Perrier nomination in Edinburgh, had rave reviews from the national press, recorded many TV & radio specials and helped begin the careers of Rory Bremner, Michelle Collins, Josie Lawrence & Bill Bailey. I performed with and wrote material for The Treason Show from January 2008 to August 2010. It's a topical, satirical & political sketch comedy show - brand new every month with up to the minute gags and songs. And Bafta nominated don't-you-know! "This Brighton based foursome are so up to date on current affairs, you wonder if they do anything but read the news and make up jokes. Brilliantly clever sketches on popular and political affairs, each short enough to keep you wanting the next. Trigger happy George Bush, alcoholic Amy and bumbling Boris are all strung together with re-invented and well sung satirical pop songs - this show doesn't miss a beat. Amusing, silly and not to be missed..."
I was intending to go and watch Music Box, but they needed someone to stand in at the last minute. I ended up being in the show for another 2 years, performing in regular shows including Zoo Lates and a sell out run at the Edinburgh Festival Fringe. Nowadays I just guest occasionally. Music Box improvise a one act comedy musical based on audience suggestions, complete with catchy opening numbers, rousing counter-points, touching duets and boo-hiss bad guy songs. "...this is the purest style of improv...a precious sense of shared adventure, as the seemingly impossible takes shape before our eyes." From 2012-13, I co-created and directed a solo show for Laura Mugridge; an amazing and award-winning theatre maker and comedian. We also had Musical Comedy Awards Finalist/chum Tom Adams on board, playing his lovely tunes. The show toured to super critical acclaim and happy audiences. It's about an old man who begins floating on the surface of the water and journeys to the bottom of the ocean. It’s a true story that we made up. I first went to a workshop with Fluxx many years ago. 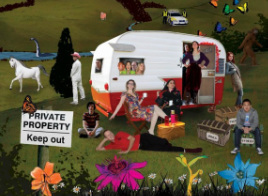 In 2010 I performed in Without Planning Permission at the Brighton Festival Fringe. In Autumn 2012 I toured the midlands with a new incarnation of this show. We hope to do a London run in 2013. The Fluxx company have been working since 1998 and have performed at theatres, arts centres and festivals within the United Kingdom, additionally touring to Athens, Amsterdam, Paris and the U.S.A. to appear at international festivals. Fluxx has defined a territory of research and practice which is some distance from comedy impro being more concerned with character, storyline and thematic content. I created this show in December 2011 as an antidote to comedy and narrative-centric British long-form. We have so far performed two two-week runs at the Canal Cafe Theatre in Little Venice. The show stars players from The Maydays and NewsRevue. Silly String Theory is an ongoing attempt to make touching, realistic long-form theatre. We connect the strands from characters' lives and pull understated songs from subtext and metaphor. katy and rach ep 4 lapse of trust 1 from Katy on Vimeo.